Truthfully, I have never sat down and watched an episode of Firefly. How do I know that the newest local sci-fi book I read She Is the End by A. C. Weston is like Firefly? From what I can gather and read on the Internet: Firefly brings together a group of people who are all unique and add a special flare to the team. She Is the End is similar but adds space witches, hired assassins, and a conspiracy theorist to the mix. 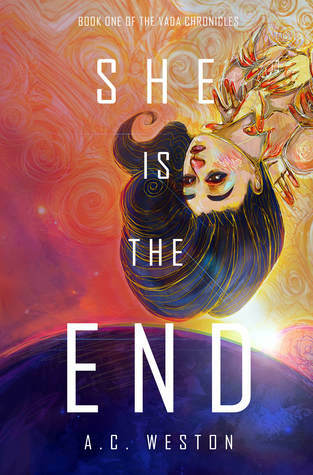 She Is the End is a well-written, sci-fi epic fantasy to help fill the void Firefly has left. Relai Aydor is a vicious, methodical queen hiding out on Earth while her home planet, Arden, is crumbling. The problem is that the real Relai hasn’t been ruling but rather has been contained in a travel pod. She’s freed and accompanied by two guards, Goren Dray and Tannor Mellick. While escaping the base, they are ruthlessly attacked by Milo Hemm and Bevn Kyro (known as Ky). The five of them start to work together as they believe Relai’s story of her throne being taken from her. Can the damage across the galaxy be reversed as Relai takes back her throne? One reason I connected to the story is the relationship and growth between the characters. Milo Hemm is introduced as the “Monster of Eray” because of his violent nature. Throughout the story, I believe he becomes more empathetic to the other characters. However, my favorite character is Tannor because of how strong of a character she is. She doesn’t need a man to save her, and she’s incredibly intelligent. She’s also amazing with technology and, to be honest, without Tannor the group would probably have been killed early on in the story. One thing I think She Is the End could have used was a map of the galaxy. At CONvergence, I attended a worldbuilding panel, and the panelists talked about adding a map of their world to the books they write. As a reader I would have liked to see a map of all the planets in She Is the End. I felt as I read this book, I was often confused about where these planets are in relation to each other. Parts would be more clear to readers if there was one page in the beginning showing the planets and even listing which characters were from where. A. C. Weston created She Is the End as a new-adult book, meaning the protagonists are between the ages of 18 and 30. She is planning on writing two more books in this series with parts for both of them already written. Weston has created a website for the book, which features drawings of the characters and a free ebook download. Otherwise, Weston can be found on Inkshares as well. Shout out to Firefly fans; this book is for you. There are so many characters in She Is the End to connect with, plus there’s an epic action sequence that takes place right in the heart of downtown Minneapolis. Unlike Firefly, this story won’t be discontinued.